"Today's decision from the U.S. Supreme Court comes as no surprise. This case, Janus v American Federation of State, County and Municipal Employees (AFSCME) was backed by anti-worker extremists seeking to further rig the economy and limit the power labor has when unions are strong. 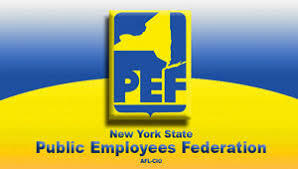 The New York State Public Employees Federation (PEF), and other unions in New York state and around the country have been preparing for this decision with vigorous member engagement campaigns, involving thousands of one-on-one conversations with workers at all state agencies and departments about the value of being a union member. What the anti-union groups don't understand is the power of our union comes from our members and their commitment to fight to better provide for their families and serve their communities, not from money! We will not let any court case stand in the way of our fight for good, union jobs that our communities need. We know when unions are strong, we have the power to raise wages, secure basic needs such as health care coverage and a dignified retirement, making life better for our families and our communities. No court case, no billionaire and no propaganda campaign can stop us. We are stronger together!"